Hog plum or tallow wood, Ximenia americana, is a multi-trunked woody shrub or small tree in the Olacaceae family. It is a lower canopy tree and can reach a height of 20 feet or more at maturity. The name Ximenia comes from, Francisco Ximenes, a Spanish monk who published information on the plants and animals of Mexico in 1615. 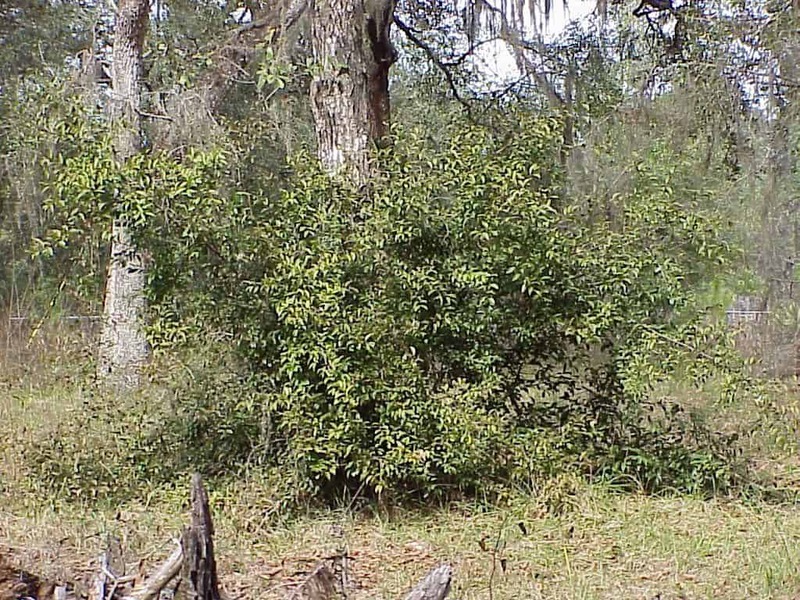 It is found occurring naturally in coastal areas, scrubs, hammocks, pinelands, and disturbed sites. Some hammocks may contain many of these plants spread out over a large area. It is found in northeast Florida south throughout the Keys, and is quite common in our area. Hog plum is semi-parasitic on the roots of nearby plants. The parasitic roots (haustoria) have been documented on a variety of vegetation found in the same habitat, but it has also been found to thrive without a host or haustoria. It is not host specific and does not cause harm to the host plant. The leaves are glabrous, alternate, simple, with entire margins, and a notched apex. They may be elliptic, oval, or oblanceolate in shape and approximately 2 to 3 inches in length. The upper surfaces are a shiny green, and the lower surfaces are a paler green. Sharp, rigid, spines can be found in some leaf axils and at the axils of the branchlets. Ximenia is sometimes confused with Bumelia and can be distinguished from it by a small tooth at the leaf apex and a grooved petiole. These features are very small and the use of a hand lens may be needed. 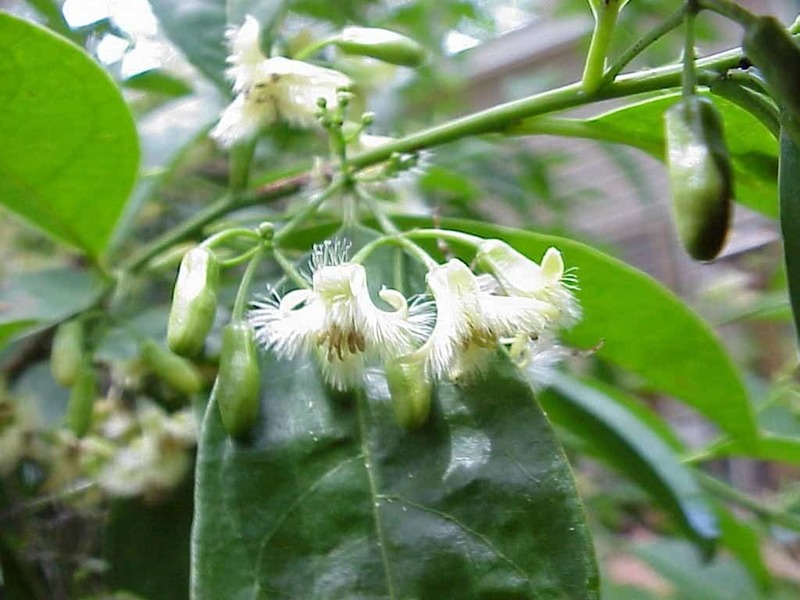 Its flowers are yellowish in color, extremely fragrant, and appear in late spring, summer and fall. The 1/2 inch flowers are borne in a cluster at the end of a peduncle (stalk) that is approximately 3/8 of an inc used to make jams and jellies. The fruit does contain hydrocyanic acid and should not be consumed in large quantities. 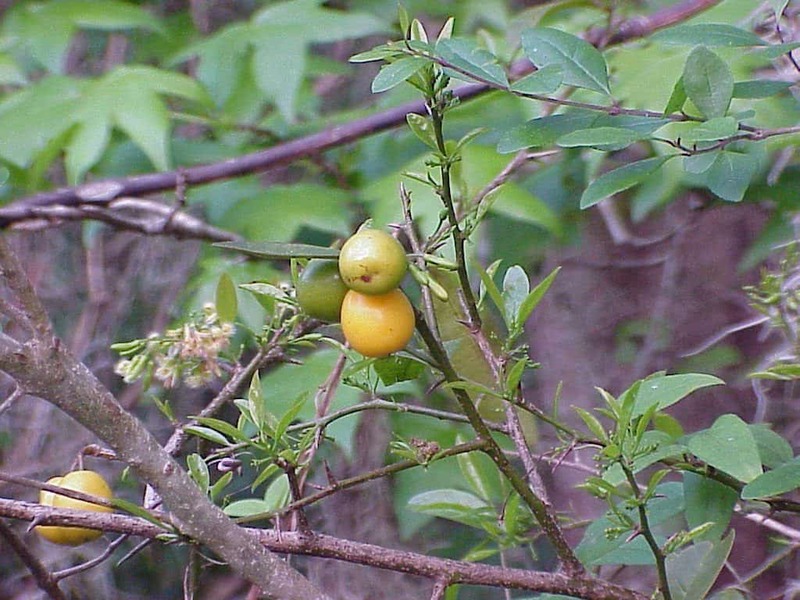 Hog plum is an excellent wildlife habitat plant. The pollinators that are attracted to its flowers provide an excellent food source for birds and lizards. Green anoles love to lie in wait for a nectaring bee or wasp to happen by so they can make lunch out of it. The dense, thorny, foliage provides excellent protective cover from predators. It will thrive in dry, to average, soil conditions without any care other than the initial acclimation process. This makes it an excellent plant for the home landscaper looking for carefree or xeric type plants. It may not transplant well every time, however if you plant it near the base of a larger tree it may have a better chance of survival.